Gardening resumes on Sunday 14 April at 3.00. We provide tools, and welcome anyone who would like to join in. We are just changing our site to fit our new logo and look. Hoping this helps develop our community and encourage even more participation in looking after our wonderful park. We hope you can join us this evening, Wednesday 16th May, at 7pm for the AGM – see details in previous post below. We welcome your ideas and input into making the park enjoyable for all. Also the first of this year’s Gardening Sessions (weather dependent!) on Sunday 20th May at 3pm. Please join us and share your ideas to improve the park! The RBS has submitted an amended application for Planning Permission in Principle for a mixed use development on Dundas Street, Fettes Row and Royal Crescent. 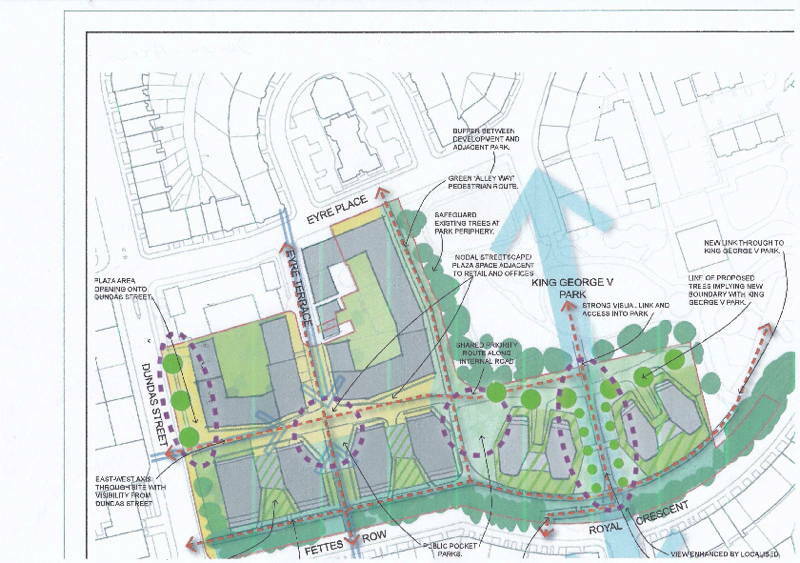 Included is a proposal to build four x four storey blocks of flats in Royal Crescent on the south boundary of the park and construct four x five storey blocks to the south west of the park in Fettes Row. These features of the application have the potential to change the nature of a very special park irrevocably. SO PLEASE DO COMMENT. and key into the Search box 16/05454/PPP. 1. Height of proposed built development. Previous application December 2016 was for four x eight storey buildings on the south boundary of the park (Royal Crescent). 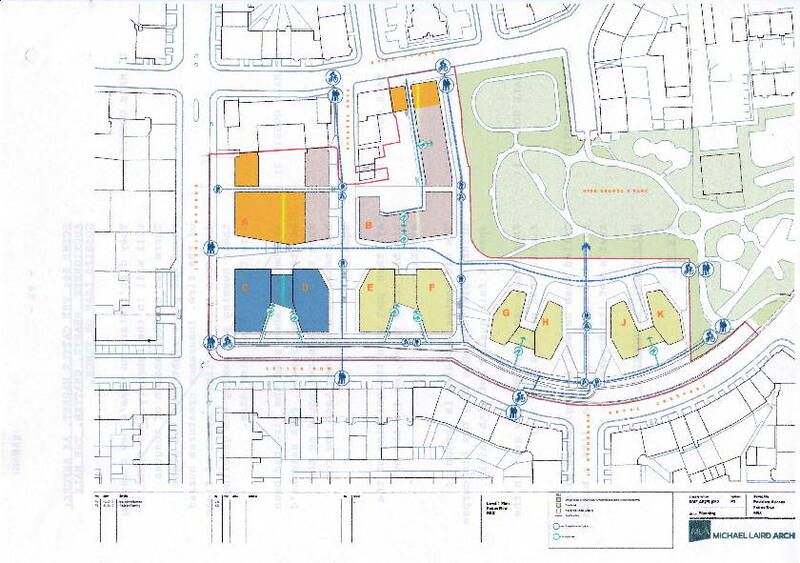 The amended application proposes four x four storey buildings. Instead of four x six storey buildings to the south west (Fettes Row) the current proposal is four x five storey buildings. Furthermore, the already consented four storey building to the west of the park rises to five storeys at the junction with its proposed east-west wing. An amendment to the previous application was suggested by Historic Environment Scotland (the Government’s influential advisory body on heritage matters) of four x two storey buildings to the south and four x four storey buildings to the south west (ie. in this case no higher than the existing building). The Friends of the Park welcomed this suggestion. Of course, this is a better planning application, but is it the best? Does it sufficiently negate the damaging impact of buildings on the edge of the park? We urge all park users to think about it and, please, let the Council know their views. 2. Density of proposed development. This remains at 400 housing units, bringing a potential 765 new residents into the area immediately bordering the park. The park is already only half the size recommended by the Council’s Open Space Strategy. Could this place undue pressure on a limited and precious green resource? Again – do, please, let the Council know what you think. Park users who responded to the previous version of this application should know that the comments they made then will still stand and will be taken into account. No need to repeat them if they are unchanged, but it might be wise to refer to them. There was a big response to the application in its previous form. Help us create a similar response this time round. We need the best possible outcome for the park. Please join us on Sunday afternoon for another short go at gardening. Since we met last month a group of volunteers from Aecom have done some great work on edges to the paths and in the playground. The rain has freshened up the plantings a bit and softened up the ground. We can do a little weeding to keep it all under control. Also it will be interesting to hear your ideas on what we could improve in the park. We have tools, so just bring yourselves at 3pm on Sunday 11th June. We look forward to seeing you them. 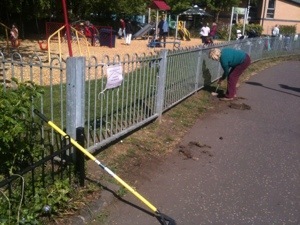 Sunday to clear litter and help with a bit of gardening. As well as a bit of weeding we started on sorting the path edges. All were agreed that it’s great to see those beautiful setts again. Our park ranger is working with a corporate volunteer group later this month. We hope to be back for more in June. Please get in touch if you are interested in joining us.